Meet Boyd Lemon! He Has A Free Gift For You! BOYD LEMON: A man of integrity with writing talent. Intellectual, thoughtful, interesting and creative. I became an early bird with the birth of my second child and have been ever since. After dinner, I can’t seem to accomplish anything productive, but I am usually quite productive starting as early as 6:00 a.m.
2. Other that writing, do you have any additional creative outlets? From time-to-time I draw. I drew the image that is the cover of my first memoir, “Digging Deep: A Writer Uncovers His Marriages.” It is a self-portrait in pencil. I drew it while writing a particularly emotional part of the memoir, and I felt like it captured my pain. Being near the edge of a steep cliff. I’ve read that this means I want to jump, but I don’t believe that. I have never been suicidal. The thought of ending my life is out of the question for me. I love life too much. 4. What books did you like as a child? I loved adventure stories as a child, especially westerns, which were very popular during the 1940s and ’50s when I was growing up. I loved a series of books about the lives of Wild Bill Hickok, Kit Carson, Buffalo Bill, Lewis and Clark and other similar western heroes. From my early childhood, my favorite was “The Little Engine That Could.” I loved stories of heroes who overcame big odds against them. I still do. My new novel, “A Long Way To Contentment” is actually about a modern day hero of sorts. 5. And your all-time favorite movies are? Lawrence of Arabia, Dr. Zhivago and Silver Linings Playbook. Like many other men, I am in lust with Jennifer Lawrence. She happens to be a superb actress also. 6. Who do you message most on Facebook? My younger son Adam. We message each other about our love of baseball and the team we root for, the Los Angeles Dodgers, and sometimes other things. 7. Your first kiss was with . . .
My first kiss was with my first love when I was 12 years old. Shortly thereafter, her mother caught her frantically putting her clothes back on soon after I had left her room. She had stripped for me. That was all. Nothing else happened. But that marked the end of the relationship. 8. Type A is a bad boy and type B is a decent guy…. Who do you identify with the most? Type B. I was always pissed that Type A always seemed to get the girl. I could never understand why girls went for guys who would abuse them, instead of a nice guy like me. I wouldn’t want to live with either. 9. You’re a girl! What type of fiction heroine would you be?Jane Eyre or Lara Croft? Jane Eyre. I couldn’t handle a Lara Croft. 10. Favorite genre to read and does it happen to be the genre you write in? Literary novels. I have written one and probably will write another. 11. Let’s look at your Kindle, Boyd. What are you reading right now? “The Greater Journey: Americans in Paris by David McCullough.” I was drawn to it because I lived in Paris for a year from 2010 to 2011, the experience of a lifetime. There is no city in the world like Paris. 12. Do you prefer to read paperbacks or E-books? I read both, but more Kindle books than paperbacks. I read them on my iPad. I like the two page format on the iPad. It is more like reading a print book, except clearer, and I can read in the dark. 13.And the well-thumbed books you can read over and over again are? “Housekeeping” by Marilynne Robinson; “I Know This Much Is True” by Wally Lamb; “The Prince of Tides” by Pat Conroy; “One Hundred Years of Solitude” by Garcia Marquez; and Tolstoy’s “Anna Karanina;” and many more. The next set of questions are about your writing style– Boyd. Are you okay with that? He nods. He’s just fine with talking about writing. A little of each, depending on where I am in the story. 15. Do you have a writing schedule set in stone? No, but I usually write in the morning after coffee, breakfast, dog-walking and shower. However, if I awake with an idea, I get out of bed and start writing. Sometimes I keep going well into the afternoon. It depends on how the writing is going. 16. Do you like to work solo or do you like critiquing buddies? Solo until I feel that I have finished whatever I am writing and have made it the best I could. I lack self-confidence, and I’m too self-critical to show my writing to anyone until I have a completed, polished product. 17. And the biggest hurdle you have getting words on the page is and how do you beat that hurdle? Getting started is the most difficult for me and many other writers. If I am having trouble getting started, I make an appointment with myself and keep it. It helps sometimes to get away from home to write––in a café or a park. Once I start, it usually flows without a problem. Sometimes it’s pure crap, but I get it down on the page easily. 18. So, what’s on your desk, Boyd? Only my computer. I am a neatnik. It will be a while. I have written 7 books in the last 8 years, and I need some time off, so I’m not working on any major projects in 2014, just some writing practice and a couple of short stories that I may or may not publish. I plan to start another novel in 2015, but I don’t have a story line yet. I have several ideas floating around in my head––maybe a political novel, maybe something about climate change. I don’t know. You don’t have to wait for the next book though! 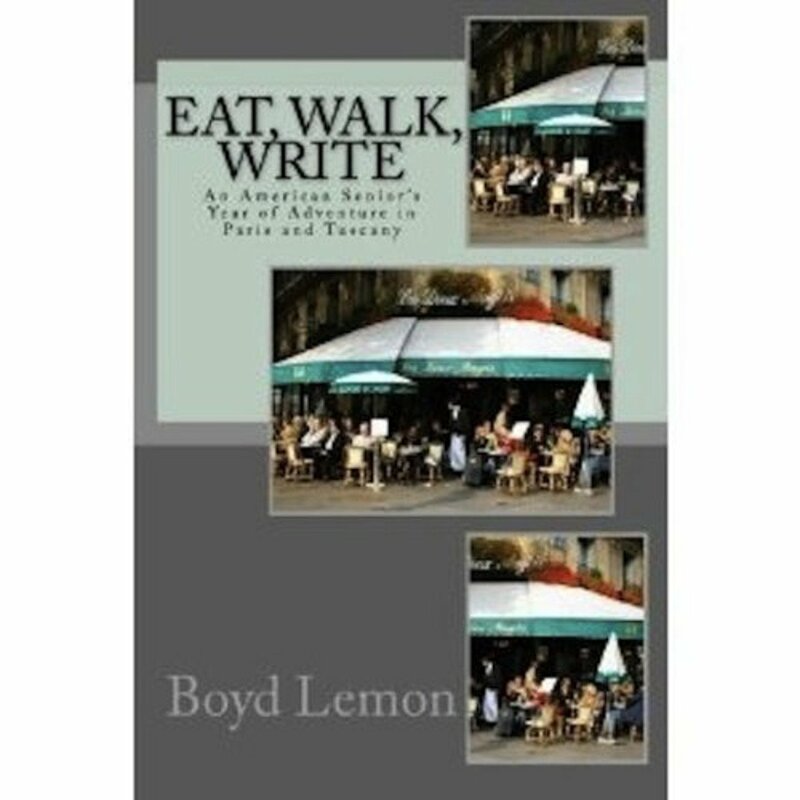 Boyd’s bestselling “Eat, Walk and Write” is now FREE from Amazon! Nice interview. Good to see it in print vs. a voice link that may or may not transmit well.